Who could vote against a Bill known as the Patriot Act? Wisconsin's Senator Russ Feingold spoke out against the anti-terrorism bill on October 25, 2001, and vowed to vote against the bill. He did this for very sound reasons - he wants Congress to work not only to stop terrorism, but also to protect our civil liberties as much as possible. His Statement to Congress is long, but well worth reading. In addition to stating his personal, and emotional reactions to the attacks on September 11th, he writes about the protection of civil liberties, the over reaching scope of the anti-terrorist bill, and the history of limitations on civil liberties during wars and other troubled times in our nation's history. "Sneak and Peak" searches, new treatments of computer crimes, and lowered standards of due process through the Foreign Intelligence Surveillance Act Courts are some of the issues that Feingold raises. Russ Feingold was the only dissenting vote for the terrorism act that passed through the Senate. After reading his statement, I respect his conviction in standing for his beliefs. We can only hope that some of his very well reasoned concerns are addressed in the near future. His vote wasn't for terrorism, but rather against a bill that could have the power to strip us of our civil liberties. Who voted against the Patriot Act? It was a patriot that did. William Penn organized a nonprofit organization in 1764, called the Trustees of New Castle Commons. The Trustees act as an integral part of the management of the commons areas of the City of New Castle. In addition to caring for commons lands, they encourage historical preservation, have built a new library and firehall for the city, and amongst many other fuctions, support education for City residents by financial grants. This organization is the only one of its kind in Delaware, and may be unmatched throughout the rest of the United States. At one point in time, New Castle was the colonial capitol of the State of Delaware. If you would like to capture the spirit of America in the 1700's, the City of New Castle is a thriving example. Ever seen a historical marker at a location in Delaware? Curious as to where those came from, and how to find other locations which have similar markers? The Delaware Public Archives are the ones who place those signs in Delaware. The Historical Markers program is part of its mandate, as a state agency. Markers are placed at historically significant locations and sites across the state, in New Castle County, Kent County, and Sussex County. Delaware has a rich, living history. We walk cobblestone streets (mayhap they be refurbished), and meet in century old buildings. Some insight and handy links to life in Delaware can be found at Delaware Living . While some of the more traditional history resources can be found at the Historical Society of Delaware. Volunteer recruitment that really works. How do we develop creative volunteer roles? Community resources to recruit volunteers. Recruiting volunteers from your current "Circle of Resources." How do we build a stronger staff/volunteer partnership? How do we find daytime volunteers? Where should we place our volunteer ads? Directory of Volunteer Management Software. They also cover topics like grants, tradeshows, building a website, jobs, donors, and risk management. Their magazine, called "Good Cause" is filled with articles that can keep you informed of what's going on in Delaware's nonprofit sector, and a listing of volunteer opportunites in their Random Acts of Kindness section. Many questions have been raised regarding airport security over the last few weeks. Should security be overseen by the federal government? Should security personnel at airports be federal employees? Efforts to increase coordination between the FBI and state law enforcement units regarding passenger lists have also been a topic of much discussion. Many of these questions and issues will probably be answered within the next week. President Bush has vowed to issue an executive order regarding security at airports if Congress doesn't make decisions on those issues soon. A secret court for hackers? A government anti-terrorism group has recommended just that step. This cyber court would be based upon another court that exists now, and conducts its business in secret. That other court is comprised of a rotating membership of federal court judges, and has been empowered under the Foreign Intelligence Surveillance Act. The FISA court is in charge of issuing warrants during investigations, and the cyber court might hold a similar role with respect to crimes on the internet. MBNA steals away Delaware's Anti-Terrorism Chief. , just one week after he was given the title. Corporate credit card giant, MBNA, has been drawing upon a string of Delaware's experienced safety and security personnel over the past few years, the most recent of which was the acquisition of Sean Mulhern. Mr. Mulhern, former chief of the Wilmington Fire Department and Director of the Delaware Emergency Mangagement Agency (DEMA ), was named as Anti-Terrorism Chief by Governor Minner on October 19th and resigned to take a new post with MBNA on October 26th. His new role will be as Vice-President for safety and security. This week, the spirit of those who fight fires in Delaware is being celebrated. From the red line painted down the middle of King Street in front of the Daniel Herrmann Courthouse, all the way to the floor of the Senate in Washington, D.C., Delaware fire fighters are highly visible. And they should be. These are people who run into buildings that others are fleeing for their lives from. People trained in saving lives, and preserving property and livelihoods. You can show your support for the firefighters of Wilmington this weekend by showing up for the "the largest parade in Wilmington in 50 years," and for open houses at all city firestations, as Wilmington's Fire Department Celebrates its 80th Anniversary. The parade starts Saturday morning at 10:00 am, and goes down King Street from 16th Street to 4th Street. While Mayor James Baker's press release does mention that volunteer firefighters from across the State will be present, he doesn't say whether Milton will send representatives. But chances are very likely that they will. (Maybe they will bring their newest ladder truck. 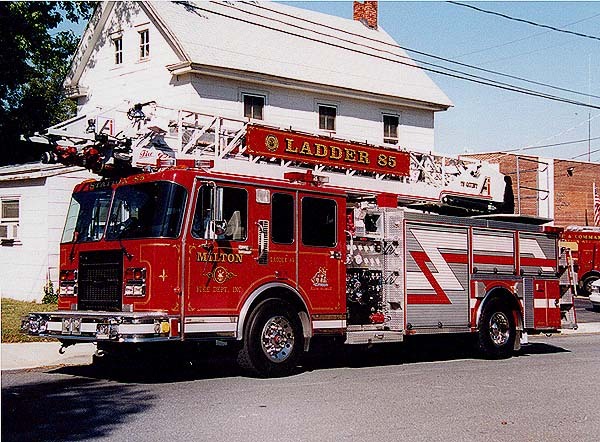 )Milton's Volunteer Firefighters' recently celebrated their 100th year as a firefighting company, and they were cited for their spirit, their determination, and their unity by the United States' Senate yesterday. Senator Joseph Biden made a point of conveying the Senate's congratulations to the Milton Volunteer Fire Department on their 100th anniversary. Maybe that holds true for all of us, and is a spirit that we all should share. Delaware Facts Contest. This first Delaware Facts Contest Question will be easy. As time goes by, we may get tougher ones. This question closes for entries at Midnight on Halloween, October 31, 2001, or as soon as we get a correct answer. Watch out for the time change. 1. What is the Delaware State Bug? Some entries at this site are submissions from third parties. This section of my website is intended to offer commentary and debate as well as information, news and web links. We welcome your input and suggested postings, but I reserve the right to accept, modify, or refuse article submissions for any reason or no reason at all. Over the next few months, I will be hosting a Delaware Facts Contest on this website. I intend to post Delaware Facts questions and award Delaware memorabilia prizes. This contest is not open to my employees, relatives, relatives of my employees, etc.. I will be the final judge as to the entries, which will be evaluated for both historical accuracy and the time order in which these submissions are made. Responses are to be e-mailed to me. We are not responsible for technical difficulties which interfere with either the transmission or reception of contest entries. I reserve the right to ask for shipping charges for the prizes, should the prize winners be outside of the U.S.. Good Luck! Delaware. Small State, small accessible government. 96 miles long, and from 9 to 35 miles wide, Delaware measures next to last in the state size competition. We like it that way. Our small size enables Delawareans, and Delaware Corporations, to have a more direct and accessible government. I will frequently pass a governor, U.S. Senator or Congressman on the streets of Wilmington as I traverse the court system. How many California or New York residents have that sort of a small town government feel? And while on Delaware soil, we are never more than 48 miles from our state capitol, and never more than 24 miles from a Court of Chancery. We are spoiled by this closeness, and we aren't looking for a change. When is an an engagement ring really yours? Regularly we in the legal community come across cases of shattered love that turns into litigation over the possession of the engagement ring. A recent commentary outlines some of the complications and recent holdings. But the bottom line is...nobody wins. The Deer Park Tavern is open again. After extensive restorations, the landmark tavern on Main Steet in Newark is open for business. Gone is "the smell" that has permeated the establishment since its dirt floor days, and back are the second floor dining areas and deck. A recently returning patron commented..."its almost too nice to let the students back in". Now all that is left is to have the raven replica return. Question: I am a Paralegal with an Attorney who specializes in Family Law. There are frequent requests for information regarding a spouse's whereabouts. One particular client stated her husband "disappeared" every Wednesday night. If the husband discovered a Private Detective was tailing him (yes, it does happen) it could bring complications to an already sensitive situation. Do you have any suggestions? Answer: Yes, there are methods utilizing technology previously available only to the CIA, or James Bond. If the vehicle is co-owned, you can install a portable GPS (Global Positioning System) to the undercarriage of the vehicle. Every three seconds, the GPS unit will "bounce" signals from the vehicle, to the street, to a satellite, and back, recording the latitude, and longitude of the vehicle. Utilizing common mapping software, the data is downloaded to a PC, and a map is created. In addition, the time lapse of each way point is recorded to identify if the vehicle was parked at any particular position for a time period greater than three seconds. And the best part is, this unit can be leased, thereby saving investigative costs. I have also used the GPS unit to track delivery trucks, and identify both theft, and sleeping delivery drivers. Question: I think our client is dead. How can I verify this? Answer: Utilize the Internet. If your client died, and Social Security Death Benefits were applied for, check www.ancestry.com. You can search by name, Social Security Number, and State. Social Security allows a death benefit ($350) for all who apply. If your client was a Delaware Resident, or may have died in Delaware, contact the Division of Public Health. P.O. Box 637, Dover DE 19903, (302) 739-4721. Write a brief letter stating the Name, any identifiers you might have (address, DOB, nicknames, additional spellings, time frame of death) and fax, (302) 736-1862, or mail to the above address. Remember to include the $6.00 fee. The State has records dating back to 1956. In addition, if the death was recent, check www.delawareonline.com for a copy of the News Journal's obit. Question: I sure could use some extra cash. Any ideas? Answer: A part-time job might help. Like most paralegals, you must have had some experience in transcribing dictation during your career. As tedious as transcription can be, it sure pays well. Use your favorite search engine (I like www.hotbot.com) to insert the word "transcribe", and pick a service. Tapes will be Fedexed to you, you complete the work, Fedex the work product back to the provider, and wait for payment. How about found money? Try www.state.de.us/revenue. Any unclaimed monies, or property, are held here. You can search the site by name. Or contact the State of Delaware, Unclaimed Property Division, P.O. Box 8931, Wilmington DE 19899-8931, (302) 577-8205. The staff is extremely helpful, give it a try! The publishing home of a number of tabloids, where a worker contracted a fatal case of Anthrax is being tested by the Environmental Protection Agency (EPA). The American Media Inc.'s offices were granted superfund status by the EPA. This designation allows the federal government to pay for the decontamination costs of the building in Boca Raton, Florida. The Food and Drug Administration covers some interesting information about bioterrorism, buying medicines online, and antibiotic resistance. Perjury in the Courtroom, when will it end? It is an all too common occurrence for litigants to lie, while under oath, in Family Court trials. And when clear documentation is then presented to refute this lie, it is very uncommon for any consequence to befall the perjurer. Is it because everyone in the courtroom has a different job description, none of which includes prosecuting the crime of perjury? Is it because Family Court is such a pit of misery, that we just want to get this case behind us and go home? A person is guilty of perjury in the first degree when the person swears falsely and when the false statement consists of testimony and is material to the action, proceeding or matter in which it is made. Perjury in the first degree is a class D felony. The law sets forth this crime, and yet it is largely ignored. And in ignoring this crime, we participate in the degrading of the integrity of the system of laws, and the confidence of the populace in our courts. I for one, hereby pledge, to personally file a criminal complaint the next time I am a witness to this variety of felony. Will anyone join me? The United States Department of Justice has made changes to the policies that they follow for Freedom of Information Act Requests. A memo from Attorney General John Ashcroft has been sent out to the executive branch agencies, making changes to a policy that had been in effect since Octobler of 1993. It's not unusual for a new Attorney General to make changes to the way that the executive branch responds to requests for information. It appears to be a bit of a tradition - something that happens normally in a new administration. This one seems to replace a "foreseeable harm" standard with a "sound legal basis" standard, but doesn't create any new substantive or procedural rights. Vice Chancellor Jack B. Jacobs was selected as this year's recipient of the Chief Justice's Annual Award for Outstanding Judicial Service. Delaware's Chancery Court is well known for the opinions that come from its judicial officers, and Vice Chancellor Jacobs has been recognized nationwide for adding to the excellent reputation that the Court has earned. An entry yesterday mentioned virtual shareholder's meetings for Delaware corporations. It appears that Washington might be considering some of the advantages of having a dedicated highspeed intranet to use in case of emergencies. An article on virtual leadership describes how President Bush met a few days ago with Cisco CEO John Chambers to discuss how broadband can be used to help the economy, and to consider the possibility of convening congress by teleconference during times of emergency, if necessary. A Delaware law that entered into Delaware's General Corporate Law last year is finally starting to get some attention on a national level. It appears that Oracle is considering holding their next shareholder's meeting electronically, for reasons dealing with security and costs. Other tech companies are also considering using virtual shareholders meetings as a means of saving on the costs of travel and security. Will something be lost in the move from a face-to-face confrontation with a CEO or other shareholders? Perhaps only time, and litigation, will tell. With more people concerned about security these days, the use of this statute may be seen by many as an improvement to the previous requirement for live and in-person meetings. On Tuesday, a U.S. Federal District Court upheld the ownership of a gun as a Constitutional Right. There had been some argument in federal courts that this right was restricted to ownership of a gun when part of a state militia. The District Court which oversees Texas, Louisiana and Mississippi decided differently yesterday. A much bigger list is present on the pages of the Council of States Governments. They have compiled a list of 193 interstate compacts believed to been in effect in 2001. One of the multi-state agencies that Delaware is involved in is the Delaware River and Bay Authority, which oversees the Delaware Memorial Bridge, the Cape May Ferry, and small airports in both States. One of the difficulties of an agency like this one is that there are often questions of how they should be policed. The Authority's Board will be considering proposals from Ruth Ann Minner, Delaware's Governor, later this week on subjects such as employee whistleblower protection and greater monitoring of the board's spending. The U.S. Department of State is the office responsible for issuing passports in the United States. They have a number of dated, but still helpful publications describing other nations' customs, currency, health issues, drug laws, politics, and other things you might consider before you travel abroad. The Canada Passport Office has an interesting article online about the history of passports. It offers some insightful information about the relationship between Canada and the United States, as it describes the history of the regulation of movement between the countries. In addition to being a source of information about international history, individual passport applications can be used as a method of finding out more about your family's personal history. The National Archives and Records Administration describes how passport applications can be a tremendous source of genealogical information, and the types of information that they can disclose. The arctic bridge between continents can be a bridge between people and a unifying step forward in U.S. – Russian relations. Progress is being made towards a collaborative sea park in the Bering Strait, thanks to a new Russian Governor. The airline industry is trying to bounce back, and airlines are offering very low rates for travel. Before you pack, and head out to the airport, be sure to check with U.S. Customs to acquaint yourself with current regulations and travel tips. Some other information and updates on air travel can be found on the pages of the Federal Aviation Administration. The Delaware Secretary of State – Division of Corporations Executive Strategic Planning Conference was held on October 10, 11, and 12. It was an informative conference which continues to foster a cooperative and productive partnership between the State of Delaware and the private Registered Agent firms. This process is key in furthering Delaware as the premier environment for corporations. As part of the closing statements, on October 12th, Secretary of State Dr. Harriet Smith Windsor related her experience at a national gathering of Secretaries of State in which it was quite evident that Delaware’s Division of Corporations was the envy of the other states. “They’re all wannabes,” Secretary Windsor quipped. The Strategic Planning Conference was successful in making plans to keep Delaware in the forefront of incorporating jurisdictions, for the foreseeable future. A new anti-terrorism bill was passed by the House of Representatives today. Delaware Republican Mike Castle attempted to amend the bill to change one of its controversial aspects, which limits internet gambling, but while he was able to rouse some non-partisan support, his amendment was voted down 25 - 37. Castle explained his amendment by saying: "My concern is we're imposing an obligation on financial companies to check virtually all of their statements, especially customers who deal with websites." Apple and HP have modified their stances regarding a World Wide Web Consortium (W3C) proposal which would include patents within the standards used to build the web. While both were involved in the writing of the new policies, the companies have now submitted statements to the W3C asking to retain royalty free standards, after an avalanche of comments from the public regarding the proposals. Concerned about getting the news straight from the horse's mouth? The Defenselink News Today page can keep you on top of press releases from the Department of Defense. A new copyright bill is headed towards the District of Columbia. There's confusion as to the required certified security technologies aspects of the law, and if they will burden the use of programming languages that aren't created by large corporations such as perl, python, etc. The Daniel L. Herrmann Courthouse has less than a year left to act as an integral part of the Delaware judicial system. Superior Court, Chancery Court, and the Court of Common Pleas are all moving from the Herrmann Courthouse into a new building along with Family Court, in the Summer of 2002. A good number of pictures of the putting together their new home - the New Castle County Courthouse are online. From the "unsafe at any speed" department comes an expose from the archives of Mother Jones. The story of a coverup regarding a Ford Motor Company car saw light in 1977. In Pinto Madness, secret documents are described which show that Ford was aware of a risk that would result in hundreds of people burning to death. A friend had one of these cars, until it spontaneously combusted in a parking lot in Newark, Delaware a few years back. Makes you think about some of the recalls we've been seeing with tires lately. A different look at preserving archives of past artistic and literary works can be found in an essay called Copy Protection Robs The Future. If you've never read the Clue Train Manifesto, and you're running your own business, but not reaching out to customers on the internet, you might want to spend some time perusing the 95 Theses of the manifesto. At least one of them will give you an idea or two about how you might want to conduct business differently. One of the most important political commentators of the twentieth century passed away yesterday, October 8th. The man who coined the term “McCarthyism” also caused two presidents to cancel their subscriptions to the Washington Post. He won three Pulitzer Prizes and shared a fourth one. His work was displayed in the collection of the National Gallery of Art. Bill Clinton honored him with the Presidential Medal of Freedom, even though he once drew a picture of Clinton walking along a tightrope with the budget balanced on one finger and an attractive young woman on the other. Herbert L. Block, better known as Herblock will be missed. There’s been a lot of press on the proposed PATRIOT Act lately, and a lot of concern about what it might mean to legal immigrants. One perspective on the bill, from Findlaw’s Legal Writ pages examines the subject in more detail in an article from Anita Ramasastry, about How The Patriot Act Will Disrupt Many Lawful Immigrants’ Lives. What kind of Robot are you? Take this test from robohouse.com and find out. Delaware’s Attorney General’s election looms on the horizon. Incumbent Jane Brady may be facing a plenty stiff challenge in Carl Schnee who is a former U.S. Attorney for the District of Delaware. While there has not been an official announcement, all indications are that he will challenge Brady for the post. Do you have a hard time saying, or even thinking about, dimpled chads? Concerned about the possibility of someday voting online? The University of Georgia is working on a Next Generation Voting System research project. A three dimensional map of lower Manhattan from CNN. The World Wide Web Consortium (W3C) has proposed a new policy related to patents, and their inclusion in web standards. This may have some serious implications for applications developers, and has some people talking about a fragmentation of the web. Speaking of standards, an excerpt from a book on the development of standard time does a great deal towards examining the importance of a standard. Speaking of patents, an article on business methods and patents called The Patentability of Internet Business Methods: A Systematic Approach to Evaluating Obviousness does a great deal to clarify some of the issues related to the patenting of such things as "one click shopping" or other business methods being quickly filed at the United States Patent and Trademark Office.